The Museum Garden behind the Honkan main building is open during the spring. 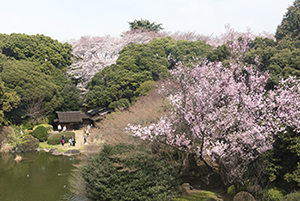 We invite you to enjoy strolling among the five teahouses, each with their own history, as well as the cherry blossoms, which about 10 varieties bloom from one to another. The flourishing garden is most beautiful at this time of the year. We celebrate this spring with opening dates extended than usual. The garden is illuminated until 19:30 on the following Fridays and Saturdays: March 30, March 31, April 6, and April 7. (1) Between the Honkan and the Toyokan, beside the restaurant "Yurinoki". *March 30, March 31, April 6, and April 7 will open until 18:00.